Dave Marsh and Mike Dermody were called to assist Surrey Search and Rescue late Monday evening [28th March]. Earlier that same day, a man had been seen to get into difficulties, following an incident involving a kayak, in the River Wey, which runs through the centre of Guildford. A search had commenced where Surrey SAR had been tasked to search the river along accessible lengths looking for any signs of the missing man. 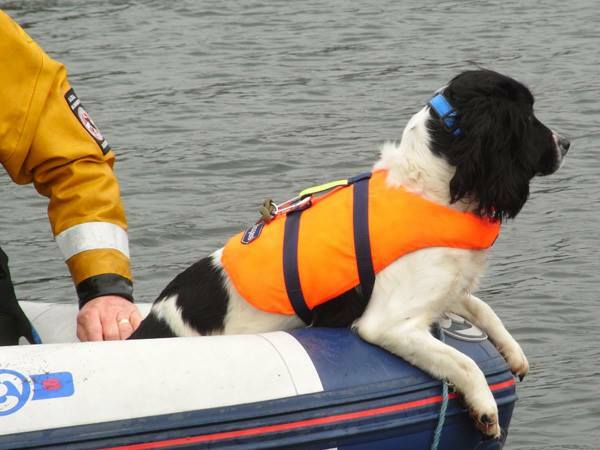 Dave contacted Seamus Kearns [ Head of Operations] Surrey SAR to enquire if our Water Search Dogs could be of use. The answer was a positive yes from Seamus. So, the following morning saw Dave [with Sasha] meeting with Mike [and Quincy] at 06-00 for the long [uneventful] trip down to Guildford. Arriving just before 11-00am, both met with members of Surrey SAR for a briefing and search deployment. Mike and Quincy searched the town centre portion working downstream, with Dave and Sasha travelled down to the end point for a return search upstream. A small number of locations were noted and searched later using Surrey’s Fire and Rescue side scanning sonar equipment. Once completed, all returned for a bite to eat, a debrief and then onward travel to home locations. At the time of filing this report, the man was still missing.